Once again, thanks to the selflessness of British collector Paul Steinson, we are able to enjoy two acoustical rarities. The first was recorded on a very wet day in 1923 - in Peckham! As the set was issued in July 1923, I guess these sessions took place in the first half of that year - does anyone have a more precise date? The recording was mentioned in The Gramophone in January 1924, in Compton Mackenzie’s quarterly retrospective, but, as far as I can make out (since The Gramophone’s online archive is so hard to search), it was never fully reviewed - I wonder why not? This is often stated to be the Concerto's first recording; most of Arthur de Greef’s version with Ronald on HMV (D 890-92) was actually waxed earlier, in 1922, but not completed until September 1923. 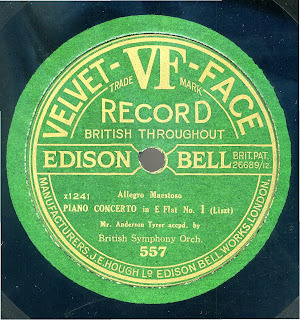 This Velvet Face version has a cut of a few bars marked Grandioso at the end of the first side, not a bad one; otherwise, it is complete. I have merely run Mr. Steinson’s dub through ClickRepair, with decrackling, and joined up the sides (as you will hear, since the surface noise changes quite abruptly). Download the single, fully-tagged mono FLAC file from my midden. 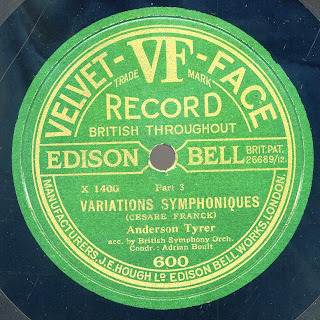 This set, recorded complete, was issued in November 1924, when it was reviewed in The Gramophone. The reviewer, Peter Latham, preferred Arthur de Greef’s 1922 version with Ronald on HMV (D 697-98), transferred and recently uploaded by this enterprising fellow-blogger (doubt he's a fellow-troglodyte, though). I'm just glad to have both! Technical bits as above. Download the single, fully-tagged mono FLAC file from here. Dear Troglodyte, very interesting posts, this and the ones earlier. Thanks a lot for sharing! Nick - Thanks so much for Mr. Tyrer and Dr. Boult! Just sat down and listened to these through the ol' music box and WOW what special find they are! The piano sound in the Franck is particularly surprising. Better, in the main, than much of what passed for Hi Fi in the early LP era, I say. I was also wowed by your transcription of Ruhlmann's "Tannhäuser" recording. I want to hear more of him! I’ve ordered my copy – thanks again! I hope you will soon return to your cave and offer more fascinating musical stalactites. Perhaps the holidays have you particularly grumpy and un-share-y? I wish you fine fettle and swift return to these parts. Best wishes from snow-obliterated new york city!